Keep your plants safe & thriving or Start your seedlings early in Palram’s Harmony 6X8 that merges a smart, clean design with a beautiful, functional & sturdy structure, creating a simple assembly and improved use. Sliding panels’ assembly system, no glazing locking parts are needed. The Harmony is made from robust corrosion resistant & durable aluminum powder coated forest green frame and crystal clear virtually unbreakable polycarbonate panels. Offering over 90-percent light transmission yet blocking 99-percent of the harmful sun’s rays, protecting your plants and equipment. It is practically maintenance free. A galvanized steel base is included as well as vent and gutters, allowing for water collection. 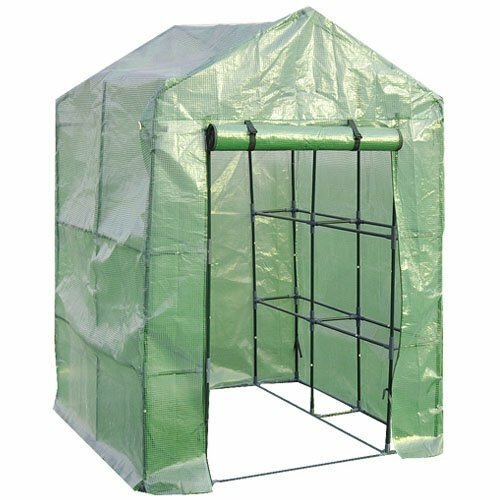 Hinged door can be assembled from either right or left and has a friendly magnetic door catch to keep the greenhouse open. The Harmony features High headroom and eaves for improved working space. Offering over 90-percent light transmission yet blocking 99-percent of the harmful sun’s rays. 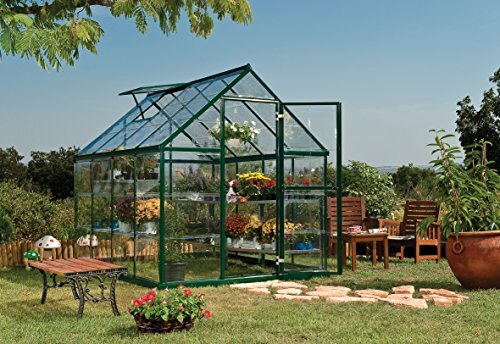 The Harmony is made from robust corrosion resistant & durable aluminum powder coated forest green frame and crystal clear virtually unbreakable polycarbonate panels.